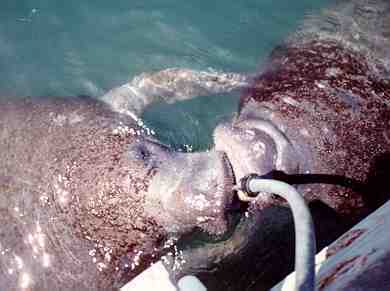 Kiss me you Fool is a photo my daughter Sarah took of two Manatees sharing a drink of water at the docks in Ft Pierce. Manatees live in brackish or salt water but are mammmals and seem to like to drink fresh water as much as you or I. Someone in the city lets the water run just a little bit and the manatees hang around and share it. Click on the picture of Sarah to see the big picture. See the section under Manatee for more photos and more information. If you like the picure just right mouse click on it and follow the directions "to save the image as". The code name is 2mana309.jpg The file size is about 12k. There are several in this collection that are screen size. Click on the picture Kiss me you Fool to go back.